Today’s lesson is about some best practices for Gmail login, and risks you would possibly encounter if you often visit malicious web sites or if your computer is infected with viruses or spyware. If your Gmail account is important to you, we firmly believe that all the tips in this article will be of great benefit to you. There has been so many cases about people’s Gmail accounts got hacked and a big portion of them are because they carelessly entered their username and password on a fake Gmail login page that looks exactly like the genuine Gmail page. You have to be very careful. There are a lot of such scam and fraudulent sites around the web that try to steal your account id and password. Thus, you have to make double sure that the Gmail login page you’re looking at has the correct and genuine URL from either gmail.com, mail.google.com or accounts.google.com (current Gmail login page). Fraudulent sites usually linked from phishing emails, appear from pop ups of some websites full of malware, or that if your computer has been infected by Trojan horses or viruses that would alter the home page of your browser and redirect the Gmail login page to their fake ones. If in that case, we would urge you to scan your computer for viruses and spyware, remove any unknown toolbars from your browser, change your homepage back to your desired one, and avoid visiting malicious sites that contains malware. It’s best to consult a computer expert to solve your computer issues to get rid of those fake sites if you happen to see them very frequently. If you’ve accidentally attempted to login to your account in these fake sites, we would urge you to reset your Gmail account password immediately. To do this, go to gmail.com or accounts.google.com. Click the “Need help” link below the password field. Follow the on-screen instruction to proceed resetting your Gmail account password. Since not long ago, Google introduced the new login page for all Google products. 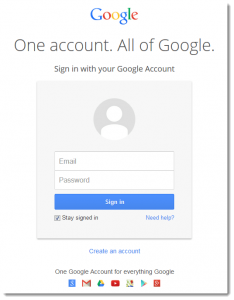 It means that with one google account, you can access to all other Google services including Gmail. This is a great improvement but many people find this confusing. You have to understand that Gmail is a part of Google products and therefore, to access to Gmail, you will have to sign in to your Google account first on the accounts.google.com page. Even if you go to Gmail.com now, Google will redirect you to this login page first. After logging in there, you will be redirected back to your Gmail inbox page. Well, because of this feature, if your Google account ever get hacked it can be a very serious issue because whoever stole your account details have the access to all your other Google products such as Google Drive, Adsense, YouTube, Google Plus, etc. To further reduce the risk of getting hacked, we highly recommend users to enable the 2-step verification process for your Gmail login. Also, if you happen to have multiple accounts, you can sign in to additional accounts by clicking your profile photo at the upper right corner of Google page and then click on the “Add account” button. You can then switch between accounts by clicking your profile photo again and then click on whichever account that you would like to sign in to.